How much weight do you use when you go diving? If you're anything like me when I first started diving it's probably too much! When I first started SCUBA diving, I did not know I was over-weighted. It had never really dawned on me to check how much weight I needed. I was trained with 12 pounds of lead and that is what I dove with. That is until I got to my Instructor Training Program. My instructor stripped me down to four pounds and proceeded to tell me that I was diving with way more weight than I would ever need, although he was not so nice about it. Needless to say, I felt a little silly on that day. I wish someone would have told me something prior to sitting in a pool with a seasoned instructor trainer…I was red-faced with embarrassment on that day! How much weight are you taking with you when you dive? Are you sure this is the right amount? If you’re not 100 percent sure that you’re using the correct weight, then you need to read on. The only way to properly determine how much weight you need in the water is to perform a buoyancy check. A SCUBA diving buoyancy calculator may be a good idea in theory, but you will only know the right amount of weight by getting in the water and checking yourself. A buoyancy check is when you place yourself in the water and, through trial and error, find the right amount of weight which you need to SCUBA dive. Having the correct amount of weight to act as ballast is super important. If you have too little weight, you will float towards the surface, especially at the end of the dive when your cylinder is lower on gas. If you have too much weight, you will work harder, possibly have your body in a poor position in the water column, and could even place yourself in a potentially dangerous situation. The goal of being properly weighted is to end your dive perfectly neutral when you are at your reserve pressure, with little to no air in your BCD. If you still need air in your scuba diving buoyancy control device (BCD) when you are at the reserve pressure at the end of the dive you need to ask yourself why? This extra weight simply caused you to exert more energy throughout the entire dive and likely caused your breathing rate to go be higher than it needed to be. Before I begin to explain how you can perform a buoyancy check, you have to understand what can affect your buoyancy. Salt water is denser than fresh water. This means you will need more lead in salt water than you will in fresh water. Your regulator, BCD, fins, etc. all have weight associated to them which can affect your buoyancy. Depending on the cylinder you are using, you may need to add weight to offset for the cylinder being low on gas at the end of the dive. This is one of the trickiest factors to consider. The reason why is because a cylinder may be negative and sink at the beginning of the dive, but positive and float at the end of the dive when it is near empty. You have to consider that the compressed gas in the cylinder has weight too. This video below shows you a simple experiment I conducted to illustrate the point. If you are wearing a neoprene wetsuit the neoprene is positively buoyant. Depending on the thickness of the suit and your body size, you will need to offset the buoyancy of the wetsuit. Fat is less dense than water, so it tends to float. If you have more body fat, you will probably need more lead to offset the positive buoyancy caused by the fat. Lung volume; everybody’s lungs are different. Because we are breathing while underwater, this is the one variable that is constantly changing, however, a bigger lung will have more air in it than a smaller one and hence require a little extra lead. Because of all of these variables, especially the ones dealing with your body composition. The only way to figure out how much weight you will need when diving is to perform the buoyancy check. The way I like to perform a buoyancy check is wearing whatever I will be using for exposure protection (i.e. wetsuit or drysuit) and in the same type of water I will be diving in (If you will be diving in the ocean, you need to do this in salt water, the amount of weight you use in a pool will be different than what you might use in the ocean). I like doing the buoyancy check for just my body, and then a separate buoyancy check for just the gear. There are two reasons why I like doing it this way. First, it is easier in my opinion to balance in the water and find the right amount of weight for just yourself. Second, I tend to dive different gear configurations and different cylinders for different purposes. By separating the amount of weight I need for myself from the weight I need for my gear, I am able to easily adapt for different cylinders and gear. If you dive with different gear configurations, you may want to consider doing the same thing. So how do you perform a buoyancy check? 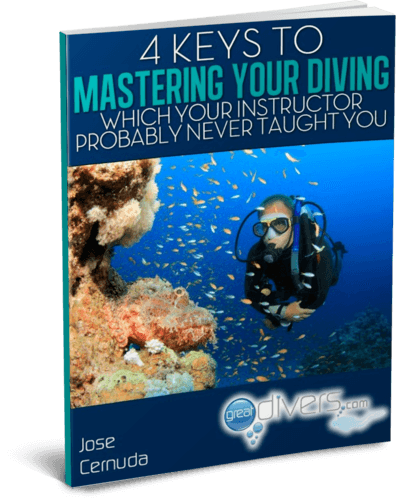 Below are the steps as well as a video showing you how to do a buoyancy check. Step 1: Standing in water that is about neck deep. Take a weight of about 2 pounds (1 kg) and hold it behind your back. Step 3: Now slowly ease yourself into the water. You want to go really slow to prevent yourself from bobbing up and down if you float. Step 4: Make a note of where you are in respect to the water level and your head. If you sink, underwater, you will need to try with less weight, or maybe even no weight. If the water level was below your forehead (your eyes as an example) you will need more weight. Repeat this exercise with more weight until you find the correct amount of weight that is needed to be right at forehead level. Step 5: Once you find the correct amount of weight, make a note of it. This is how much weight you need to be neutral in the water without scuba equipment on. If you know how much weight you need for the scuba equipment, and your cylinder at reserve pressure then add these two numbers together and you will know the total weight you need in the water. Once I know how much weight I need for myself, it’s now time to do the same for my gear. The gear is actually a bit simpler since there is no balancing required on your part. Step 2: Start with 1 pound (1/2 kilo) and place it in your BCD’s pocket or attach it with a string if your BCD has no pockets. Step 3: Notice if your Scuba Rig sinks of floats. If it floats, add more weight until you can get the rig to be just neutral or ever so slightly negative. If it sinks with no weight added to it whatsoever then you do not need any weight to compensate for your rig’s buoyancy. Once you know the amount of weight that you need for yourself and the amount of weight that you need for your rig, all that is needed is to add the two numbers together to arrive at how much weight you should be carrying into the water. Always keep in mind that the number you arrive at will change if you change cylinder types, exposure protection, move from salt to fresh water, or if you gain or lose weight yourself. Also, the amount of weight you arrive at with a buoyancy check is not a number set in stone it is simply a best starting point. Once you start diving, you may notice that you can actually use less weight, or maybe that you’ll need slightly more. If you decide to add or eliminate weight do so very slowly. Your goal should always be to be neutrally buoyant with no air in your BCD at the end of your dive with the cylinder at its reserve pressure. How much weight are you using when you dive, and what type of exposure protection and rig are you using? Let me know in the comments below.